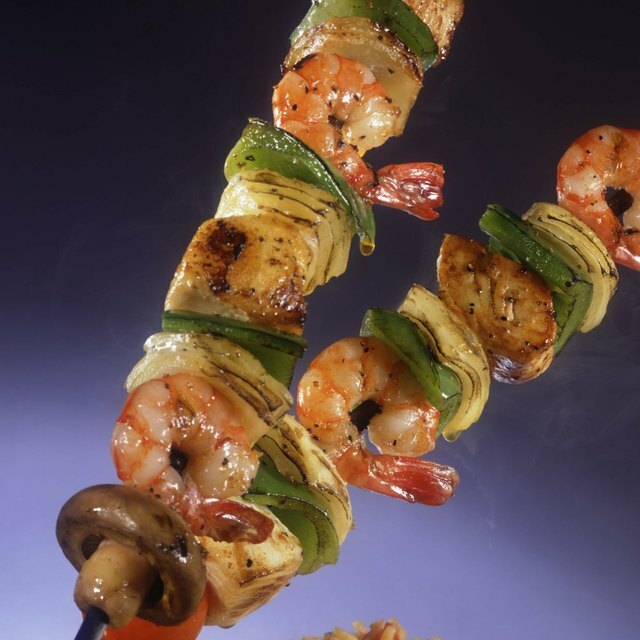 1 What Goes on Shrimp Shish-Kabobs? 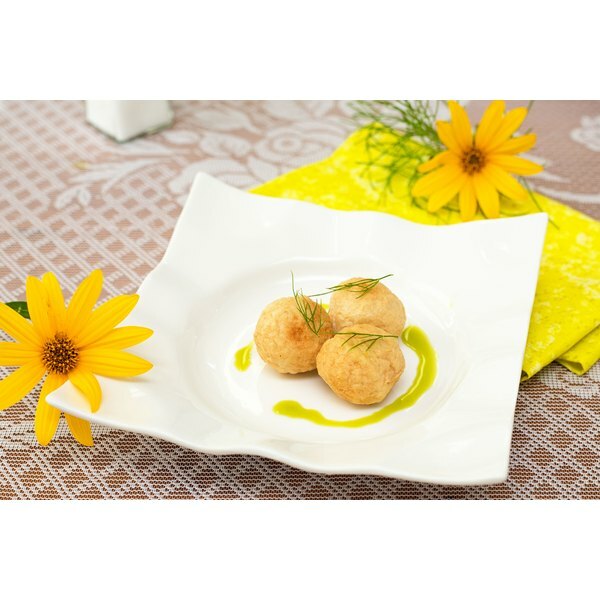 Plating your food is something few home cooks take into consideration, but it is an essential element of food presentation among professional chefs. By plating food in a visually appealing way, the meal becomes like a piece of art that is more enjoyable to eat. White plates are often used because they provide a blank canvas that allows the food to take center stage. The shape of your plate plays a major role in food placement. The clock method of culinary plating requires chefs to think of a plate like the face of a clock. Each section corresponds to a number on the clock to create different sections for placing food. The conventional placement of food with the clock method dictates that starchy foods be placed at 10, the meat at 2 and the vegetable at 6. Some chefs choose to use square or triangular plates, in which case the clock method doesn't work the same. If using a square plate, you should divide the plate into quadrants and plate food according to the shape of the plate. Similarly, a triangular plate should be divided into thirds when considering the placement of food. Stacking food is a technique that adds a dimension of height to culinary plating, forcing the diner's eyes to move upward. Chefs commonly use this technique to make smaller courses look more plentiful. Desserts and salads work well with this technique because they are generally smaller than the main course. Be careful not to stack messy foods, however, because of the risk of the foods falling in the diner's lap. You can stack food free-form or use a mold to create a precise stack. An empty food can with both ends removed makes an ideal stacking mold. You simply place the can on the plate, add the different layers and then gently slide it off to reveal a perfect stack. Sauces are a part of many courses, from appetizers to main courses to desserts. The presentation of your sauce can ruin your plating appearance or enhance it depending on how the sauce is added. When it comes to meat sauces and gravies, many cooks are quick to pour the sauce over the meat, but this disguises the appearance of the meat. Instead, pour a pool of sauce under the meat to serve as a background for your main course. Swirling is a popular technique for plating sauces, but don't overdo it. A single swirl is usually all that's needed to make your plate look appealing. Adding sauce to a squirt bottle or dropper first will give you more control over the placement of your sauce.